If you have a cherry tree with leaves peppered with small circular red to purple spots, you may have a cherry leaf spot issue. What’s cherry leaf spot? Read on to find out how to identify a cherry tree with leaf spot and what to do if you have leaf spots on cherries. What is Cherry Leaf Spot? Leaf spots on cherries are caused by the fungus Blumeriella jaapi. The disease is also known as “yellow leaf” or “shot hole” disease and also affects plums. English Morello cherry trees are most commonly afflicted with leaf spot, and the disease is considered to be serious in the Midwest, New England states and into Canada. The disease is so prevalent is has been estimated to infect 80% of eastern United States orchards. The disease must be controlled annually lest it overtake the orchard, which can reduce yields by almost 100%. The fungus overwinters in dead leaves and then in the spring, apothecia develop. These lesions are small, round, red to purplish to start and as the disease progresses, merge and turn brown. The centers of the lesions may fall out and give the leaf the characteristic “shot hole” appearance. The “shot hole” appearance is more common on sour cherries than sweet varieties. Older leaves yellow prior to dropping from the tree and severely infected trees may become defoliated by the middle of summer. Spores are produced on the underside of leaf lesions and look like a white to pinkish mass at the center of the lesion. The spores are then ejected during rain events starting at petal fall. If cherry leaf spot is allowed to go unchecked, it will result in several negative effects. Fruit tends to be dwarfed in size and ripen unevenly. The tree will be more susceptible to winter damage, loss of fruit spurs, small fruit buds, decreased fruit size and yield and eventually death of the tree occurs. Trees that become infected early enough in the spring set fruit that fails to mature. The fruit will be light in color, soft and low in sugar. 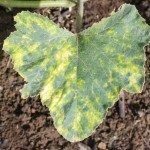 Due to the detrimental long-term effects of the disease, it is extremely important to get a handle on the management of leaf spot. Management is done through the application of fungicides from petal fall through to the middle of the summer. Also, remove and destroy fallen leaves to eradicate as much of the inconspicuous spore bearing structures as possible. To further reduce the infection rate, add a layer of straw mulch to the ground once all the leaves have been raked up. If a fungicide is in order, begin applying two weeks after blossoming when the leaves are completely open. Repeat according to the manufacturer’s instructions throughout the growing season including one application post-harvest. Look for fungicides with the active ingredient of myclobutanil or captan. Fungicide resistance may develop if the fungicide is applied too frequently; to prevent resistance, alternate between the myclobutanil and captan. Also, fungicides with the active ingredient copper may show some effectiveness against leaf spot.